Well, if I use it up, I have to replace it, right? 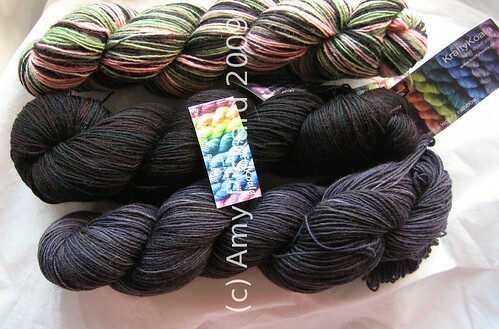 Top to Bottom: Gothic Rose (that I’m affectionately calling Zombie Rose), Midnight Tempest, Tornado. From Krafty Koala. At-frickin’-last, I remembered to order this book! I’m a little happy. The rest of the “stuff” will be arriving in April when they are released. Want to wait until then to find out? 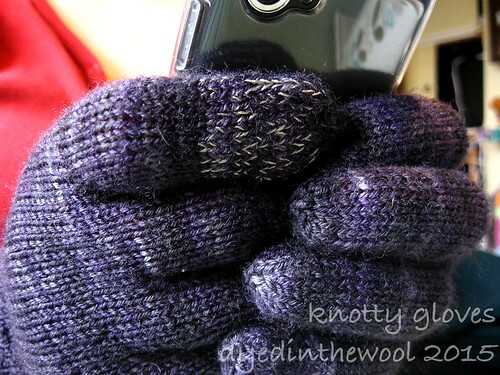 Hopefully I’ll get around to making the other Knotty Glove! This is my first actual glove with 4 fingers and a thumb. No, really. 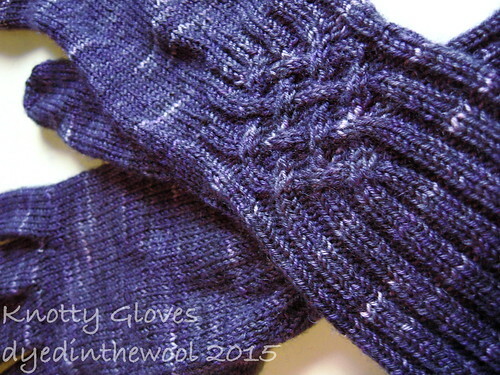 All the other hand-coverings I’ve made have been mittens or had some or all of the tips of the fingers missing. 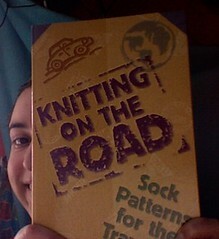 I haven’t knit the pattern exactly as directed (now there’s a surprise! ), but I’ll detail my modifications in the FO post. 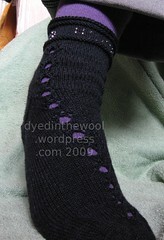 I finished the first Guided by Love sock. It’s very comfortable to wear and the Braille on the cuff is a great touch! And before someone asks, no I won’t send you a copy of the pattern. Yes, I’ve been asked. Great comments on my Class of 2005 “award”. Something was nagging at the back of my brain that I’d been blogging since 2004 and I was right! The 8th of October 2004, to be somewhat more precise. I’ve not really celebrated my blogging anniversary, but maybe I should?